There are few things better in the winter than a mug of steaming hot cocoa (especially when there's homemade marshmallows involved!). But sometimes you get tired of the same old instant packet with its watered-down taste and less-than-stellar mini mallows. If you *really* want to take your seasonal sip to the next level, try this unicorn hot chocolate recipe. It's the most Insta-worthy drink we've seen and so adorable, not to mention tasty. 1. Heat the white chocolate chips, half and half, milk and vanilla extract in a saucepan while constantly whisking (but do *not* boil!). 2. Whisk in the pink food coloring until it's the hue you like. 3. Pour into mugs and top with whipped cream and sprinkles. Dee-lish. 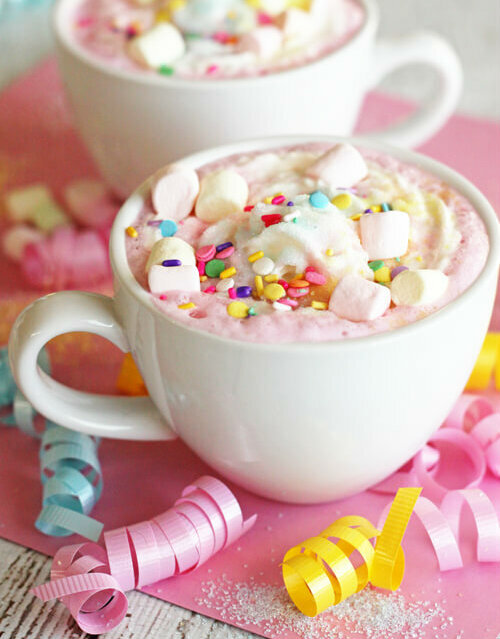 Have you ever tried unicorn hot chocolate? Let us know in the comments! Recipe credit: Fav Family Recipes.